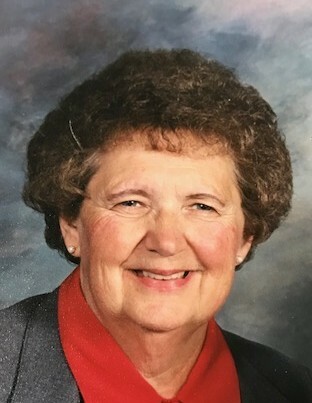 Mary J. Hawk, age 82, of Sabina, passed peacefully on Wednesday, August 15, 2018. Born in Madison County on June 25, 1936, the only daughter of the late Ralph and Faith Burchfield Reed. A long time member of the Heritage Memorial Church in Washington CH, Mary retired from Sabina and East Clinton Schools as a secretary. She was a den leader for Cub Scouts and a member of the Mother’s Club. Mary is survived by her husband of 63 years, Dean Hawk. Also left to cherish her memory is a son, Keith (Judy) Hawk of Centerville; grandsons: Matthew (Beth), Ryan (Miranda), and A.J. (Laura); along with 11 great grandchildren. In addition to her parents, Mary is preceded in death by daughters, Kristy and Kimberly. Family will receive friends at the Heritage Church, Washington Court House, on Monday, August 20, 2018, from 10-11:30 am, when a funeral service will begin. A luncheon will be held at the church following the service. Following the luncheon, a procession to Sabina Cemetery for the committal service will occur. Arrangements have been entrusted to Littleton Funeral Home, Sabina.